The succession of events that culminates in the asexual reproduction of a cell; also known as cell division cycle. In a typical cell cycle, the parent cell doubles its volume, mass, and complement of chromosomes, then sorts its doubled contents to opposite sides of the cell, and finally divides in half to yield two genetically identical offspring. Implicit in the term “cycle” is the idea that division brings the double-sized parent cell back to its original size and chromosome number, and ready to begin another cell cycle. This idea fits well with the behavior of many unicellular organisms, but for multicellular organisms the daughter cells may differ from their parent cell and from each other in terms of size, shape, and differentiation state. The time required for completion of a eukaryotic cell cycle varies enormously from cell to cell. Embryonic cells that do not need to grow between divisions can complete a cell cycle in as little as 8 min, whereas cycling times of 10–24 h are typical of the most rapidly dividing somatic cells. Many somatic cells divide much less frequently; liver cells divide about once a year, and mature neurons never divide. Such cells may be thought of as temporarily or permanently withdrawing from the cell cycle. The cell cycle is divided into two main parts: interphase and mitosis (see illustration). During interphase, the cell grows and replicates its chromosomes. 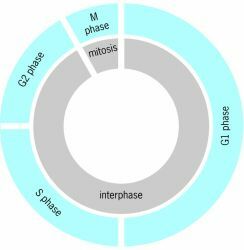 Interphase accounts for all but an hour or two of a 24-h cell cycle, and is subdivided into three phases: gap phase 1 (G1), synthesis (S), and gap phase 2 (G2). Interphase is followed by mitosis (nuclear division) and cytokinesis (cell division). This relatively brief part of the cell cycle includes some of the most dramatic events in cell biology. Gap phase 1 begins at the completion of mitosis and cytokinesis and lasts until the beginning of S phase. This phase is generally the longest of the four cell cycle phases and is quite variable in length. During this phase, the cell chooses either to replicate its deoxyribonucleic acid (DNA) or to exit the cell cycle and enter a quiescent state (the G0 phase). The portion of interphase that follows S phase is called gap phase 2. Some cells can exit the cell cycle from G2 phase, just as they can from G1 phase. The network of proteins that regulate DNA synthesis (G1/S), mitotic entry (G1/M), and mitotic exit (the transition from mitotic metaphase to anaphase and then out of mitosis) appears to be well conserved throughout eukaryotic evolution. At the heart of these cell cycle transtions is the periodic activation and inactivation of cyclin-dependent protein kinases. In addition, in multicellular eukaryotes, pathways regulating entry into and exit from the cell cycle entrain these central cyclin-dependent kinases to extrinsic signals. In eukaryotic cells, the cycle of events consisting of cell division, including mitosis and cytokinesis, and interphase. Once the cells have entered a state of senescence, numerous genetic changes take place including cyclins, CDKs and the cyclin - dependent -kinase inhibitors 12 the cell cycle check points are controlled by p53 and pRB proteins; the tumour suppressor genes and disruption in this pathway due to DNA damage responses or other factors leads to replicative lifespan and crises. The hyper-phosphorylated pRB is unable to sequester E2F transcription factors, which then get released and available for the transcription of all the required genes for cell cycle regulation, particularly Cyclin E gene product that directly bind with cdc2 and rapidly starts DNA replication (Dyer and Cepko, 2001;. Progression of cell cycle is controlled by a series of events, including cydin/cyclin-dependent kinase (CDK) complexes and their inhibitors (Becker and Bonni 2004). elegantissima host and symbiont cell cycle distributions varied among sampling dates (Fig. Dysregulated cell cycle control is a fundamental characteristic of cancers (2). Knockdown of p15 expression promotes cell cycle progression in HepG2/CDDP/2. Literature databases were queried to devise a list of genes which are involved in cell cycle and have been reported in association with ALL (Table 1). The best described action of CDT is its ability to inhibit cell cycle progression by blocking intoxicated cells in G2 phase (8). The passage of a cell through the cell cycle is controlled by proteins in the cytoplasm, the cyclins and cyclin dependent kinase, and their levels rise and fall through different stages in the cell cycle. Shizuoka, Japan) has patented compositions and methods to inhibit the cell cycle G2 checkpoint, in particular the DNA-damage-induced G2 checkpoint, in mammalian cells including human cells. The additions bring to about 6,000 the number of terms defined, ranging from amino acids, bacteria, and the cell cycle to X-ray diffraction, Y chromosomes, and zygotes. Patent and Trademark Office has issued a patent with claims covering RGB-286199, cell cycle inhibitor, to GPC Biotech.